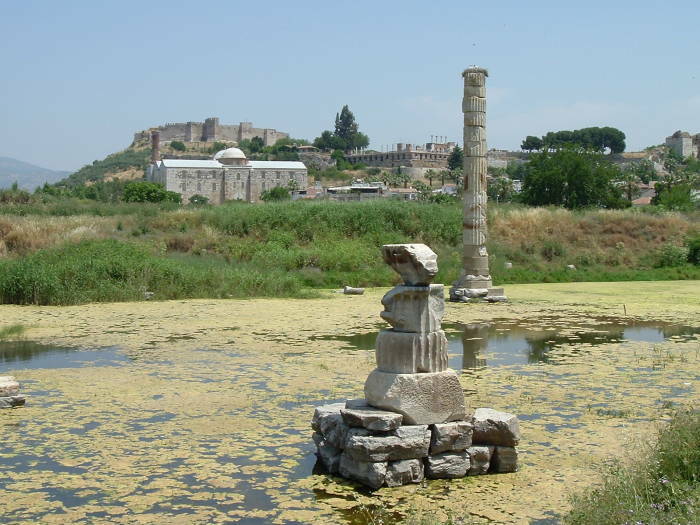 The Temple of Artemis, also known as the Temple of Diana and the Artemision, was one of the Seven Wonders of the Ancient World. Like all of the Ancient Wonders other than the Pyramids and Sphinx complex at Giza, after almost 2000 years of neglect the temple is just foundation and rubble. 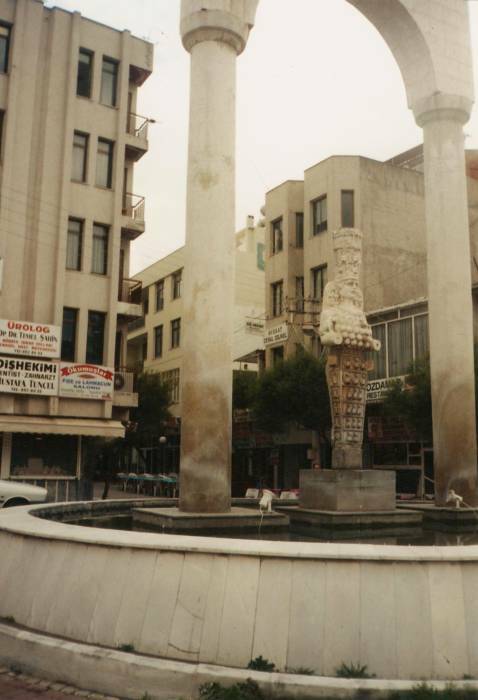 Only one reconstructed column still stands. It was 130 meters long and 67 meters wide, and it had 127 18-meter-tall columns supporting its roof. It looked approximately like the Acropolis of Athens and was built on level ground. In the distance is the Isa Bey Camii. Between the mosque and the nearby column you can see the site of the Basilica of Saint John, undergoing reconstruction. Up the hill behind that is the 6th-century Byzantine citadel overlooking Selçuk. The paving stones of the main floor are visible during dry weather. Visit in late summer or early fall to see the temple floor! 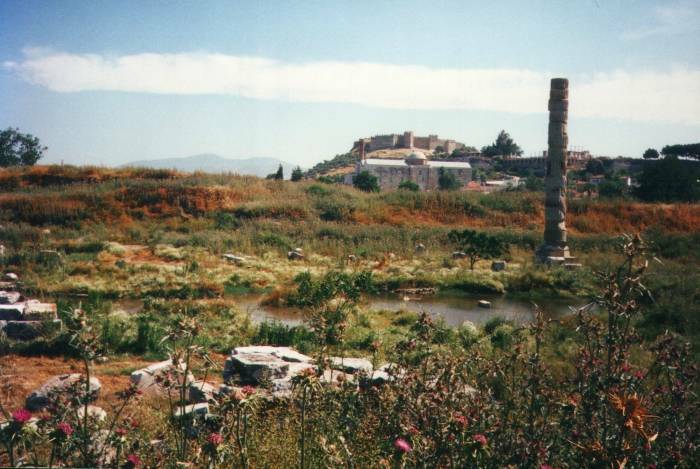 After the Temple of Artemis had been destroyed by the Goths in 262 CE, its stones were hauled up the hill and used to build the basilica in the 500s CE. Then, after that was destroyed, the stones were hauled back down the hill to build the Isa Bey Mosque — so those stones are now part of their third religious structure over a period of more than 2500 years! In spring and early summer, the temple location is flooded. Many willow trees have grown along the perimeter of the ancient temple, along the edge of the body of water that collects there part of the year. This sacred site is extremely old. 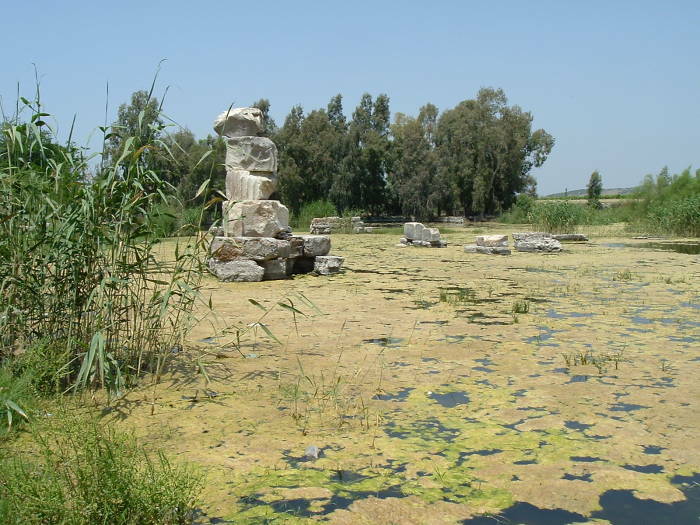 It was occupied back in the Bronze Age, as confirmed by excavations in 1986 The earliest Bronze Age version of the temple was in place before the Ionian people moved into the area. 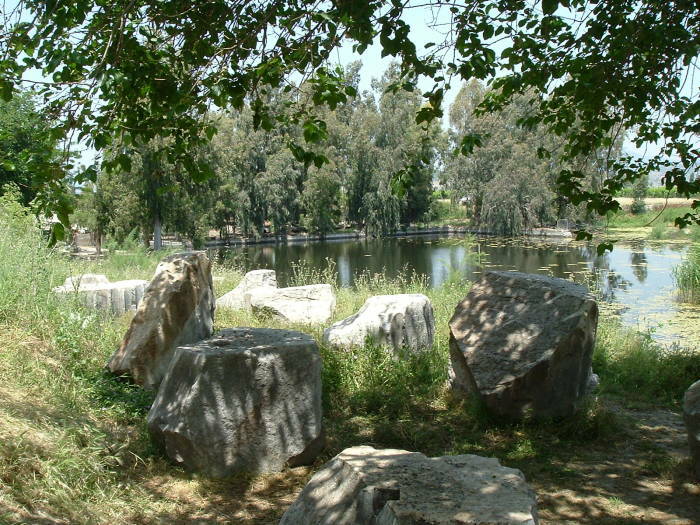 Depending on the source you read, some shrine to a blend of the Greek goddess Artemis and the local Anatolian mother goddess was established here by 800 BCE. Hogarth's 1908 book cites Pausanias, a traveler and geographer of the 2nd century AD, along with other early writers, saying "These references clearly imply a tradition of a primaeval local cult of the Mother Goddess, in which a principal share was borne by παρθένοι (unwedded women)—a feature of the cult which Achilles Tatius (vii. 13) shows to have long survived at Ephesus." Early sources reference a "primitive tree-shrine" on the site, disagreeing as to whether it was an elm or a beech tree. Hogarth describes their excavation of three successive "primitive structures," small temples, below the later versions. 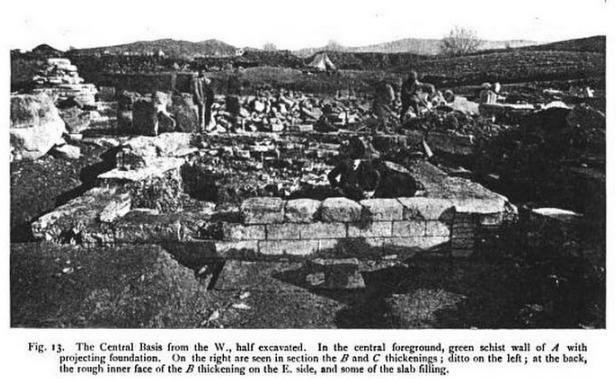 Excavation of the primitive structures in the lower levels of the Temple of Artemis, from Hogarth's 1908 Excavations at Ephesus: The Archaic Artemisia, Volume 1. 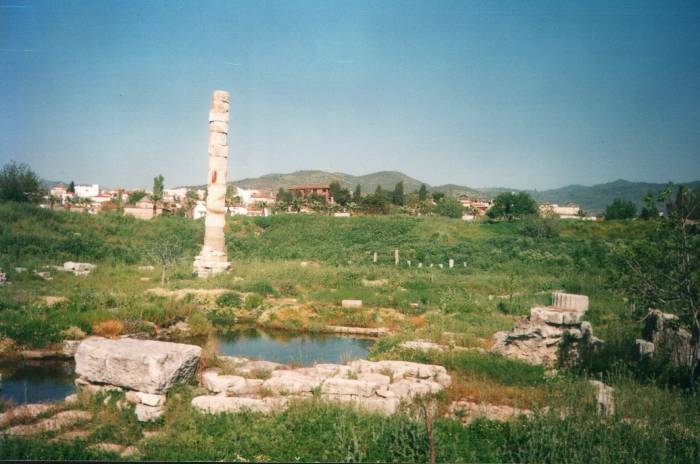 The classic temple was a 120-year construction project started by Croesus of Lydia around 680 BCE. His wealth was the basis of the saying, "As wealthy as Croesus." 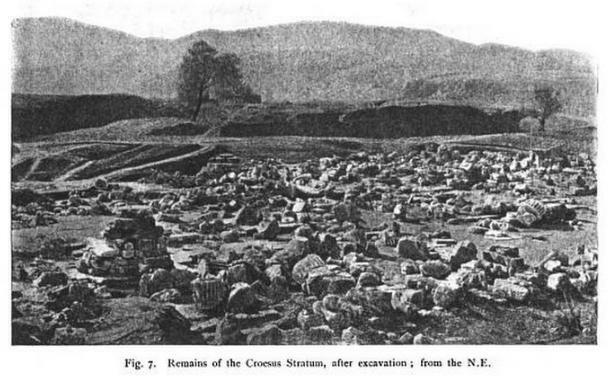 Remains of the Croesus Stratum, after excavation, viewed from the north-east, from Hogarth's 1908 Excavations at Ephesus: The Archaic Artemisia, Volume 1. Ancient sites tend to be buried under the buildup of soil that is blown or washed into place. In some locations it may build up 30-35 cm per century, meaning that a roughly 2000-year-old site is now more than 6 meters below modern ground level! The Greek goddess Artemis (known to the Romans as Diana) was the huntress goddess, twin of Apollo. However, the goddess worshiped here was much more of the West Asian Mother Goddess than the Greek Artemis (or the equivalent Roman Diana). See the page describing a walk from Selçuk to Ephesus for more on the remaining signs of mother goddess worship in the area. 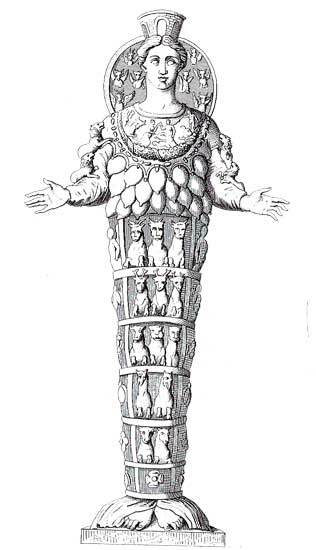 The Greeks assimilated foreign gods under Olympian forms familiar to them. 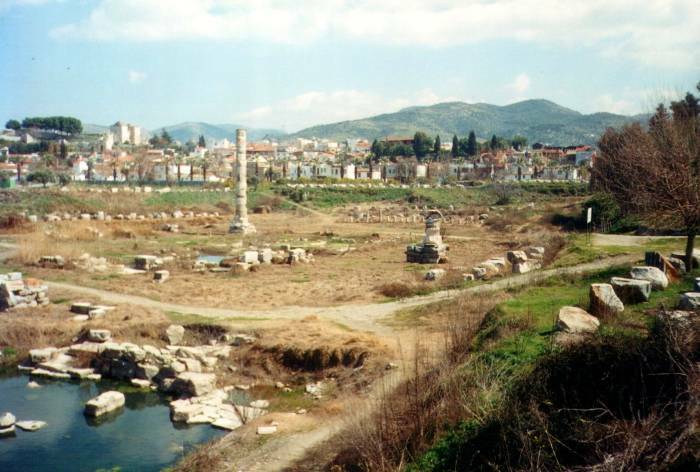 The city clerk quieted the crowd and said, "Men of Ephesus, doesn't all the world know that the city of Ephesus is the guardian of the temple of the great Artemis and of her image, which fell from heaven?" 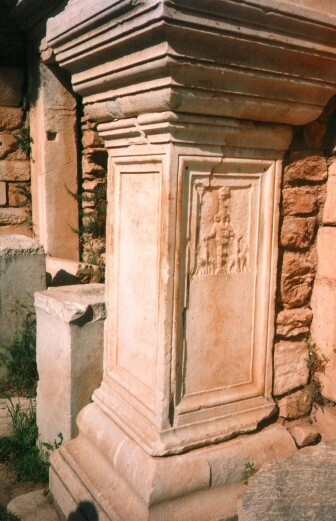 This architectural carving at Ephesus show the Anatolian goddess that the Greeks identified with their Artemis. 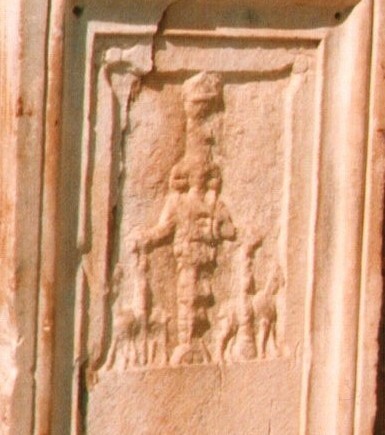 You can make out Artemis' unusual headdress, what looks like a bunch of fruit covering her body, and some hunting dogs. The real statue found at the site is in the Selçuk museum. A modern recreation of the statue stands along the main highway through Selçuk. It was completed around 550 BCE, under the Achaemenid dynasty of the Persian Empire. It was described by both Antipater of Sidon, who compiled the original list of the Seven Wonders, and much later by Philo of Byzantium. And so it became a tourist attraction and a site of religious pilgrimages over 2500 years ago! The writer Pausanias described it as the largest building in the world at that time. Then, on 21 July 356 BCE, a man named Herostratus burned it down to become famous. Apparently that worked — we do know his name! The temple was rebuilt in 323 BCE, and then burned by the Goths in 262 CE. In the 500s CE, some of its columns were transported north to Constantinople and used to build the Aya Sofya, while the remaining stones were taken away to build the Basilica of St John. When that was destroyed, those same stones were used to build the Isa Bey mosque. 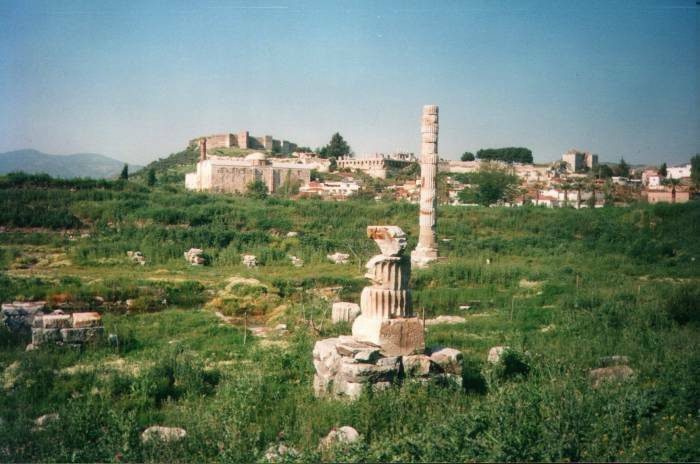 The Temple of Artemis was only re-discovered in 1869 after a long search by John Turtle Wood. There are a few artifacts in the British Museum in London. Not very much, as the temple was largely disassembled in ancient times to build the Basilica of Saint John and other structures in the area. Trying to find the temple with GPS?